This is Part II of II parts. Read Part I. Here is Russia’s problem: she wants to be in charge. Like all younger siblings, she believes she can do a better job than the first-born, who is left in charge while the folks are out to dinner. I guess that makes me a Russian, Da? But unlike the idiot nations of the West (who deny the existence or relevance of the Church), Russia is quite sure that she is both Holy Rome and Imperial Rome. That is, both Romulus and Remus. It somehow escapes her that these two are mortal enemies. You can’t be both. Which puts Russia into a class all of her own. And that’s why most Western Wiener-Dog historians can’t figure her out. They have already discounted the reality (or the need) for a spiritual head for mankind. All they can see is Caesar. They never look behind the curtain. Just like Oz. But Egbert Munzer has figured her out. Russia can marshal many facts in her claim to the chairs of both Peter and Caesar. After all, was not the Tsar the legitimate heir to the Roman (Byzantine) Empire? By both marriage and by honor? And by valor, against the Eastern Horde? Hasn’t Russia borne stupendous costs, from her very beginnings? And what three words describe her traits? Orthodoxy, Autocracy, and Nationality. In that exact order. Check out Nicholas I and Official Nationality in Russia 1825-1855 by Riasanovsky for a better understanding of the three-legged stool of Russia, as defined by the Tsar himself. And endorsed by St. Philaret, Metropolitan of Moscow. And believed by every true Russian. So what does this mean? In short, it means this; that the Autocrat (Tsar) is chosen by God to lead the Russian (Slavic) people in the true (Orthodox) faith unto the salvation of all mankind. Under the absolute and unquestioned leadership of the Tsar, of course. No questions asked. And no answers given, because no questions are allowed, of course. In other words, this is a messianic journey, for all of us. Whether we like it or not. Personally, I don’t, and I’ll tell you why. The reason is not that I don’t think Russia deserves mercy; she does. Any people that has suffered under the Pechenegs, the Mongols, the Swedes, the Poles, the French and the Germans (not to mention the Anglish bastards and their Great Game of the past 500 years) deserves a break. And ask yourself this; who has Russia invaded? Yes, I know, but who besides Crimea (where they all speak Russian)? Forget the Soviets, they weren’t real Russians. The problem is, Russia won’t ask. She won’t ask for mercy. She won’t beg. And here’s half the problem. She won’t beg her foreign tormentors, because that would be tantamount to surrender. No, she can’t do that, and I fully understand and agree with it. But there was (and is) one supra-national power, one who does not favor one nation or race over another, who could demand it from her enemies. But Holy Mother Russia won’t ask it from this power. Because this power (Holy Rome) is inherently opposed by Orthodoxy. Thus the Tsar of the moment cannot approach as a suppliant. Such an act would destroy his absolute power (Autocracy) and belief (Orthodoxy). And this would destroy the self-image of the Slavs. Thus, their lot in life is to be Slaves. Until they make their move, when the Emperor grows weak. Check your calendar, I think we’re there. Paging Mr. Spartacus, please come to the Service Desk. But let’s clarify things first. How could Holy Rome have helped Russia? Well, Holy Rome could have rallied the rest of Christendom to help her against the Pechenegs in the 900’s. The Pope could have demanded that Sweden and the Teutonic Knights stop invading in the 1200’s. The Pope could have called for a crusade against the Mongols Horde invading Moscow in the 1300’s. The Pope could have demanded that Poland and Lithuania cease their aggression in the 1600’s. And how do I know this? Because the offers were made. And all spurned in return. Spurned by Oleg the Regent, by Alexander Nevsky, by Ivan III, by Alexis I. And by Nicholas II in WWI. No, the reason I don’t like the Slavic version of the Aryan vision (one race, one nation, one Teutonic belief) is that it elevates Russia above all other nations. It makes her a super race with a super belief. If you don’t believe me, try listening to A. N. Mouravieff in his book A History of the Church of Russia (1841). Notice the title. It’s not the Church IN Russia. It’s the Church OF Russia. And now we get to the heart of Russia. She believes herself to be the sole surviving member of the Body of Christ. The only true believer. The last bastion of true belief. And this is the second half of her belief that she is the Third Rome. Both Imperial and Holy. Forget for a minute the internal conundrum of ‘Who’s on first’ in Holy Mother Russia. Is it Vlad, or is it Kyrill? It doesn’t matter at the moment. This will only come into play at the end, whenever that is. That struggle has been going on since the time of the First Romanov, Tsar Michael. And his father, the Patriarch Filaret. 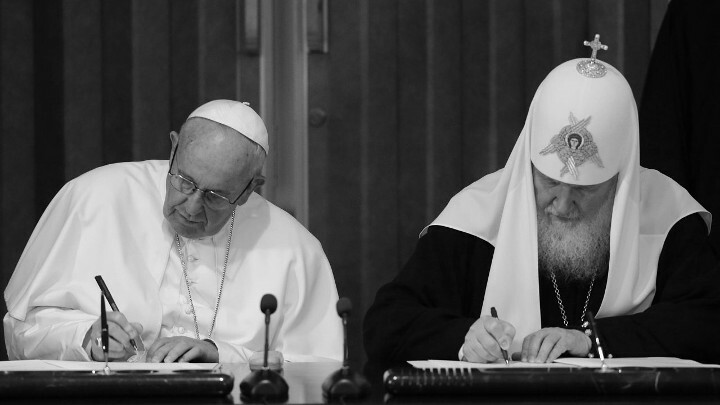 Is it Ceasaro-Papism that rules Russia, or Papo-Caesarism? This struggle will continue till the end. But only one will prevail. I contend it will be Papo-Caesarism. The Patriarch will prevail. Why? Because Orthodoxy is the primary force that keeps Russia alive. Orthodoxy, Moscow style. Forget Constantinople. Forget Antioch, Alexandra and Jerusalem. Forget these phantom Patriarchates. Why? Because they couldn’t fill a stadium with their believers even if the tickets were free. They are hostages to their Islamic Overlords. Orthodoxy, as a driving force, is purely Russian in its essence today. Don’t believe me? Then explain how Patriarch Kyrill could destroy, with the wave of a hand, the last 50 years of preparatory work by the Four Patriarchal Pygmies as they tried to call a Pan-Orthodox Council last January. It was hilarious. The charade was over before it began, as Kyrill announced that it couldn’t possibly be a Pan-Orthodox event, because he wasn’t planning to attend. Case closed. For those who are wondering what all this has to do with Russia today, I would reply that there is a replay of events going on here. As they say in football, the previous play is under review. And the review is this: have you noticed how Vlad is assiduously courting the (Russian) Orthodox Church in his attempts to keep the Slavs united behind him? Without having to totally cave in and declare that Mother Russia is indeed Holy Mother Russia? After all, that would undercut his position as the new Joe Steel. Huh? You know, Joe Stalin. The man of the people. The man who will not bend to Rome, either Imperial or Holy. And now the question for Vlad is similar to the situation Joe found himself in when he re-opened the Orthodox Churches in order to marshal the true motive force of Russia (which is Orthodoxy) in the face of the German onslaught. Remember Joe’s famous question about ‘How many divisions does the Pope have?’. Well, now the question is ‘How many divisions does the Patriarch have?’. He’s hoping the answer is ‘Plenty’. But this only digs him a deeper hole, eventually. Because every step he takes towards Novgorod (the true heart of Russian nationalism) takes him further away from the seat of his secular power in Moscow. So now it’s time for a little story. The story of The Legend of the The Novgorodian White Cowl. This is the motive lesson behind the belief that Russia is the Third Rome. This is the legend behind the belief that Russia alone is the last bastion of true Christianity. As distinct, in the Orthodox mind, from that phony, decadent, power-mad version that is still (ironically) resident in Rome. Which maddens the Orthodox heart to no end. But not to worry, Komrade, payback is coming. So here’s the story, in a nutshell. If you’re Russian, skip it, you already know this. Constantine the Great (founder of what we used to call Constantinople) desires to show homage to the Church for his victory over Emperor Maxentius at the Milvian Bridge in 312. He offers the Imperial Crown to Pope Sylvester. The Pope demurs, saying that Holy Rome is not meant to be a secular power, but rather a spiritual one. (And all of this is a hilarious counterpart to the ‘Donation of Constantine‘ that has been shown to be a historical hoax. The hilarity is in the fact that Russia denies the one but embraces the other, yet they are mirror-images of one another). Anyway, Constantine then supposedly has this beautiful white cowl made of silk to be worn by the Pope as a symbol of the purity of the Church, and by extension, the Church’s superiority over the State. Pope Sylvester supposedly accepts it, and wears it as a Papal vestment. Fast forward to the mid 1300’s, just prior to the time of the Fall of Constantinople. The Patriarch of Constantinople (Philotheus) has a dream telling him of this cowl, and how it needs to be passed on to the Metropolitan of Novgorod (the original city of Rurikid Russian power). The reason it had to be passed on was because the First Rome had fallen into apostasy under Pope Formosius (around 890 AD). And furthermore, the White Cowl, symbolizing the purity of belief, must be passed on to Russia, as Constantinople itself was fated to fall under the onslaught of Islam (because of the decadence of this Second Rome). And thus, Russia was to become the final repository of the True Faith, as they had neither apostasized nor become decadent. Case closed, right? All of this is of a legendary and fantastic provenance. Who could believe any of this? I’ll tell you who believes this. The Russians. All of them. It is at the soul of their being. Why? Well, it would be easy to disbelieve if Constantinople hadn’t fallen because of her decadence. And if Rome hadn’t suffered from some bad Popes (and I’m not looking at Formosius here). But they had, both of them. Now combine this with a national psyche that said that Russia had already suffered unjustly for 500 hundred years. And then tell me that these people would not embrace this with every fiber of their being. Do you know what the word ‘Slav’ really means? To a Slav, and not the Emperor? What is the Word, friend? But again, that’s another story. Anyway, I’m sure that you’re sure I’m mad, like all Russians. But I’m not a Russian, I’m Welsh. A Barbarian Welshman to be precise. And as a Barbarian, I never listen to anyone. I only watch what they do. That tells me everything I need to know. And here’s how I know I’m right about the Russian people and their devotion to the Orthodox vision of autocephalous belief. I’ve already said that for the past 800 years the White Cowl symbolizes their perceived pre-eminent place in the annals of time, both past, present and future. Especially the future. Again I ask, who could believe this story? I’ll tell you who. Just look at Patriarch Kyrill of Moscow today. His picture is atop the article. See what he’s still wearing? What’s that tell you? There it is: Russia wants to be in charge. Both materially and spiritually. And she has a belief system in place for both elements of human existence. And while they seem on today’s surface to be in totally synchronized symbiosis, there is an underground war going on within the Slavic world between Autocracy and Orthodoxy. And the outcome of this war will determine how Russia will attempt to gain control of the entire world stage. So let me ask you a question, Komrade. What if, tomorrow, you awoke only to find that there was a new Pope? And that he was a Russian? Would he be more powerful than Vlad? Would you want him to be? Be careful how you answer this. Neither choice (today) is pretty. At least not to me. And so, the question now is not ‘who will be merciful to Russia?’ Rather, it is ‘who will Russia be merciful to?’ That’s a question which we all have an interest in, eh? So as you ponder all of this, my friend, be sure and say your prayers tonight. Especially for Holy Mother Russia. Pray that she becomes Holy Daughter Russia. Forget France. Amen. It’s even more simple than that. Russia does not want to be patronized or bullied. Especially by decadent, politically-correct haridans. Russia despises the corrupt decline of the USA. And Russia despises American harrassment and sanctimonious lecturing on Russia’s actions in her sphere of influence. So, it’s not that they want to be “in charge” of others. It’s that they want to be left alone. Interesting, but I am not sure about many of the things you posit without doing more reading. However, one thing I agree with for sure is: Russia wants to be in charge. I also really like your comment ‘I never listen to anyone. I only watch what they do. That tells me everything I need to know.’ I wish more people were the same way. I tell this to friends all of the time, especially in talking about politicians, don’t look at what they say, look at what they do! Argh! Oh well, everyone will learn soon enough much to there own chagrin. If Russia wants to be the third and final Rome, then it won’t make sense for them to resurrect the second one, Constantinople. Playing the Muslim factions against each other does make lots of sense, hence the support for Assad. I am also curious why the Communists weren’t true Russians. Russia did invade Siberia when they weren’t yet Communists. Granted, they would not have met a lot of opposition, but what’s wrong with that? The easiest invasions are the best, right? What is this infatuation with Russia? The people are broke, the ruble is worth squat, no one wants to do business there, it’s a fascist state for all intents and purposes now. Rise? Russia? Russia isn’t going anywhere until they clean up their act, and that joke of a dictator is gone. Fascism is the Italian version of communism developed by Mussolini, an Italian socialist and communist. Did the Russian communists become Italian communists? What a great, sweeping, steaming, glorious pile of Barbaric Historic Splendor. Nice work Welshman! Is it right? Is it wrong? Beats me. Don’t know enough about the subject. But I can see that you do and your writing is full of drama and mystery and passion in the best Grand Opera style. I hope to have a winter long and cold enough to sit and read, in the cozy oak-paneled library by the crackling fire, all the books you referenced here, while the snow falls deeply out the frosted window. (Which is, ideally, how Russian history should be studied, nyet?). Here’s to your ripping good History, komrad – clink! This piece fits right in with the conspiracy theory that Saudi influences high in USA circles around Soros and HRC are driving the western world toward a hot war with Russia. Have you read “the Sleepwalkers”?